Database normalization is a technical term to improve the data accuracy and efficiency and reduces the data redundancy and inconsistent data dependency. This post is based on the Second Normal Form. Please visit the Second Normal Form of the Database Normalization at Database Normalization - Second Normal Form. A database table is said to be in 3NF if it is in 2NF and all non- keys fields should be dependent on primary key or We can also said a table to be in 3NF if it is in 2NF and no fields of the table is transitively functionally dependent on the primary key. 1. Remove the transitive dependencies (A type of functional dependency where a field is functionally dependent on the Field that is not the primary key. Hence its value is determined, indirectly by the primary key). 2. Make separate table for transitive dependent Field. When something is transitive, then a meaning or relationship is the same in the middle as it is across the whole. If it helps think of the prefix trans as meaning “across.” When something is transitive, then if something applies from the beginning to the end, it also applies from the middle to the end. An object has a dependence on another object when it relies upon it. In the case of databases, when we say that a column has a dependence on another column, we mean that the value can be derived from the other. For example, product price is dependent on the product cost. Since the columns identified in red aren’t completely dependent on the table’s primary key, it stands to reason they belong elsewhere. In both cases, we need to move these columns into the new tables. In the case of Employee Department and Department Name, a Department Master was created. A foreign key was then added to Employee Master so we can still describe in which Department an Employee is based. With these changes made the data model, in second normal form, is shown below. Now, you can see in the above example, how does normalization work on your data table and improve the data accuracy and efficiency and reduces the data redundancy and inconsistent data dependency. We have distributed a single business data table into four data tables by maintaining the relationship among them with the help of the primary and foreign key relationship. 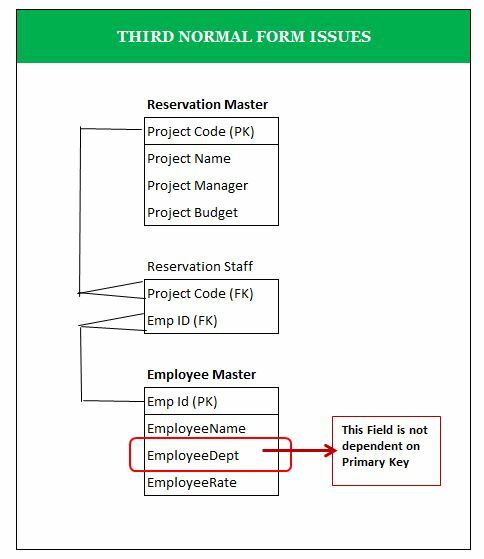 Labels: Database Normalization Basics, denormalization in sql server, normalization in sql server, SQL Server normalization rules you must follow, what is normalization?, Why You Need Database Normalization? A type of functional dependency where a field is functionally dependent on the Field that is not the primary key. Hence its value is determined, indirectly by the primary key.